Infogram allows you to embed high-quality interactive charts and infographics on your website or blog, complete with roll-overs and fun animations. But with a Pro, Business or Enterprise account you can also download static versions of your projects to use in reports, presentations, and print articles. 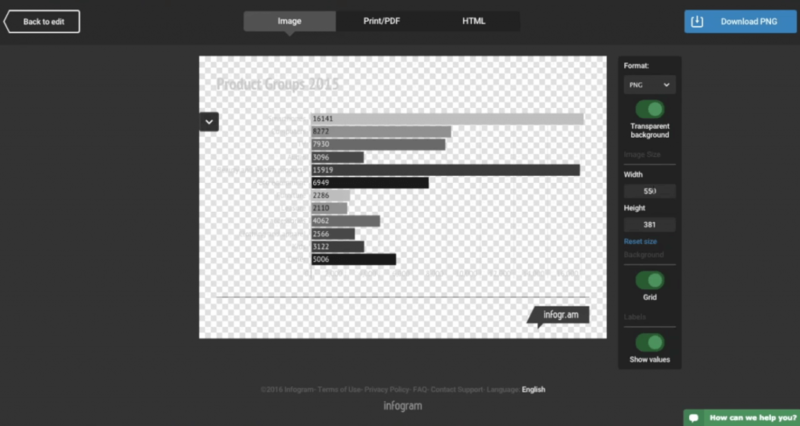 In fact, almost half of Infogram’s customers download PDF, PNG, and JPEG versions of their charts. Here are a few advanced techniques for using Infogram offline. PDF downloads give you the highest quality version of your chart or infographic, which makes them perfect for internal reports. The PDF download of your work will be an exact copy of your project as you see it displayed. From the download screen you can decide which elements you want to include in your PDF, pick the orientation, adjust the margins and determine the size. You can add your PDF to a report or print it as is. If you’re in America, U.S. letter is the perfect size for reports because your project is formatted and ready to be printed and shared with your co-workers. If you have a chart or infographic with multiple data sets, the download screen will automatically split your project into multiple charts to make sure all of your data is shown. If you don’t want to display all of the charts, the checkboxes on the top left will allow you to select which ones you’d like to see. If you want to download one data set individually, hover your mouse over the chart you want to download and click the download box on the top right. 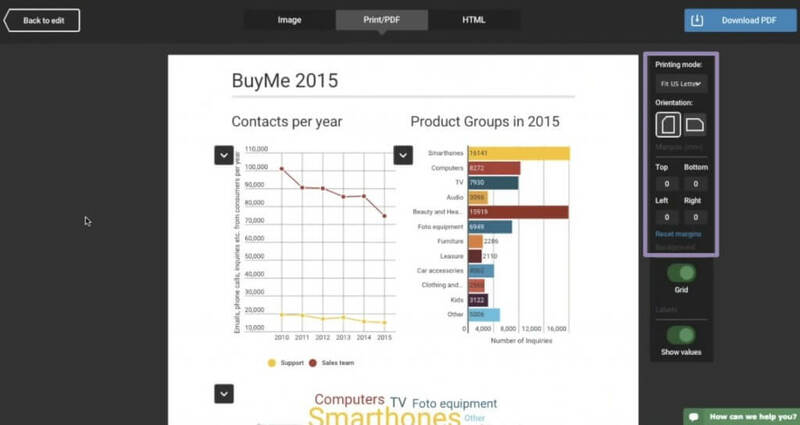 Infogram makes it easy to add beautiful charts to PowerPoint or Keynote slides. 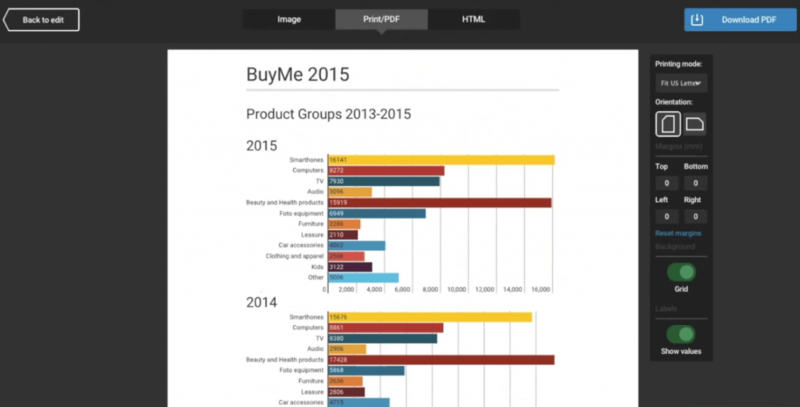 If you are preparing a chart for a presentation, you’ll want to download a PNG or JPEG. When you get to the download screen simply click ‘Image’ instead of PDF. From the download screen you can keep or remove the grid and adjust the height and width of your project. If you are preparing to download a PNG, you can make the background transparent. This makes the transition from Infogram to your presentation seamless, without interfering with your slide background. Pro Tip: When you’re adding data visualizations to your presentation, try to show one chart at a time. This will enhance your presentation, keep the viewer engaged, and make sure your data is easy to read and understand. If you have an Enterprise account with Infogram, you can choose to download your project as an HTML zip file. HTML offers you a powerful way to host interactive charts and infographics on your site, instead of embedding them from our servers. This is helpful if you are responsible for putting together interactive annual reports, and want to keep your data private. If you’re writing internal reports often, there is a good chance you are using the same charts on a weekly basis. 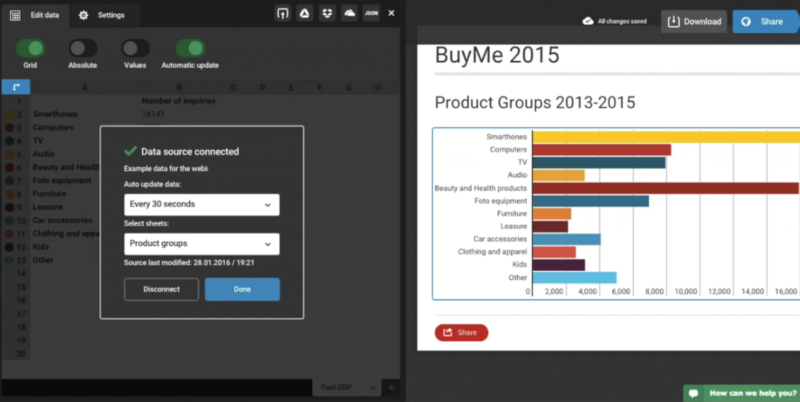 Infogram allows you to connect to Google Drive, and have your charts update in real-time, so there is no need to update the data manually. This makes it easy to get the most updated version of your charts, ready to download and share every week. Pro Tip: If you write reports or presentations often, organize your projects into folders. This makes your work easy to organize, share, and find quickly. 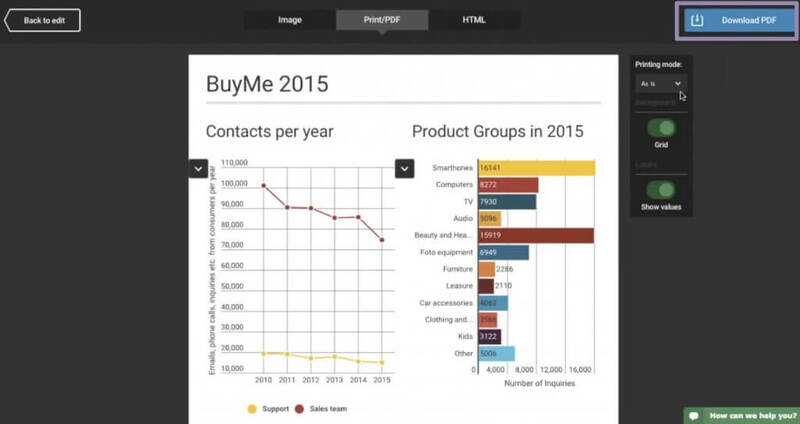 If you’d like a more in-depth look at downloading charts and infographics to use offline, watch our ‘Infogram Offline’ webinar below! Still have questions? Our Infogram experts are always ready to help. We’re committed to making sure you have the best experience possible with our tool. Set up a meeting to chat today!